In contrast, the narcissist has no private life, no true self, no domain reserved exclusively for his nearest and dearest. His life is a spectacle, with free access to all, constantly on display, garnering narcissistic supply from his audience. In the theatre that is the narcissist's life, the actor is irrelevant. Only the show goes on. The False Self is everything the narcissist would like to be but, alas, cannot: omnipotent, omniscient, invulnerable, impregnable, brilliant, perfect, in short: godlike. Its most important role is to elicit narcissistic supply from others: admiration, adulation, awe, obedience, and, in general: unceasing attention. In Freud’s tripartite model, the False Self supplants the Ego and conforms to the narcissist’s unattainable, grandiose, and fantastic Ego Ideal. The narcissist’s (and the codependent’s) introjects and inner voices (assimilated representations of parents, role models, and significant peers) are mostly negative and sadistic. Rather than provide succour, motivation, and direction, they enhance his underlying ego-dystony (discontent with who he is) and the lability of his sense of self-worth. They induce in the child shame, blame, pain, guilt, rage, and a panoply of other negative emotions. As Lidija Rangelovska notes, the paradox is that the child’s ego-dystonic shame and guilt emanate from the very primitive defenses that later comprise and underlie his False Self. Having been told repeatedly how “bad”, “worthless”, “disappointing”, and injurious he is, the child comes to believe in his self-imputed delusional ability to hurt and damage family members, for instance. Such imaginary capacity is the logical extension of both the child’s grandiosity (omnipotence, “I have the power to hurt mommy”) and his magical thinking (“I think, I wish, I hate, I rage and, thereby, with the unlimited power of my mind, I cause real calamities out there, in the real world”). So, it is the child’s natural primary narcissistic defenses that enable him to feel so miserable! These defenses allow him to construct a narrative which corresponds to and justifies the judgemental, hateful appraisals and taunts of his abusers. In his young mind, he accepts that he is bad because he is all-powerful and magical and because he leverages his godlike attributes to act with malice or, at the very least, to bring misfortune on significant others. To skirt this inner overwhelming negativity, the child “appropriates” precisely these defenses and bundles them into a protective shield, thus sequestering his vulnerable, fragile self. Occupied by the ongoing project of his budding pathological narcissism, the child’s defenses are no longer available to construct and buttress the narratives offered by the abusive voices of his tormentors. Moreover, by owning his fantastic grandiosity and harnessing it, the child feels as empowered as his abusers and no longer a victim. This substitution is not only a question of despair and alienation, as Kirkegaard and Horney observed, respectively. Following on the footsteps of the Danish proto-existentialist philosopher, Horney said that because the Idealised (=False) Self sets impossible goals to the narcissist, the results are frustration and self hate which grow with every setback or failure. But the constant sadistic judgement, the self-berating, the suicidal ideation emanate from the narcissist's idealised, sadistic, Superego regardless of the existence or functioning of a False Self. The False Self is a kind of positive projection: the narcissist’s attributes to it all the positive and desired aspects of himself, thereby endowing it with a quasi-separate existence. The False Self fulfils the role of a divinity in the narcissist’s obsessive-compulsive private religion: the narcissist worships it and adheres to ceremonies and rituals via which he interacts with it. The True Self, on the other hand, is ignored at best and usually denigrated. This process is akin to projective splitting: when parents project onto the golden child positive traits and talents even as they attribute to the scapegoat child negative, undesirable qualities. 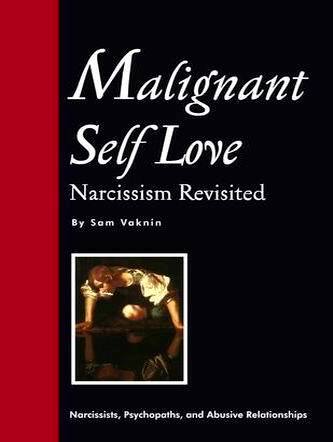 In this sense, the narcissist a parent with two offspring: his two selves. There is no conflict between the True Self and the False Self. First, the True Self is much too weak to do battle with the overbearing False. Second, the False Self is adaptive (though maladaptive). It helps the True Self to cope with the world. Without the False Self, the True Self would be subjected to so much hurt that it will disintegrate. This happens to narcissists who go through a life crisis: their False Ego becomes dysfunctional and they experience a harrowing feeling of annulment. When his wife (Jodi Foster) confronts him, having exposed his confabulations and the need to let go of the contraption, The Beaver rages at her and asserts its superiority, invincibility, and brilliance. The depressive Walter – the True Self - is derided by The Beaver as a dysfunctional wreck, utterly dependent on the former’s ministrations and the interference it runs on his behalf. The film ends unrealistically with Walter mutilating his body – literally - in order to rid himself of the domineering and all-pervasive appendage. “Unrealistically” because narcissists never succeed in resuscitating their dilapidated and crushed True Self. The narcissist IS his False Self: in real life, Walter should have been devoured and consumed by The Beaver – but then we would not have had a typical, syrupy Happy Ending, now, would we?